When reviewing a gaming keyboard it is incredibly difficult to actually benchmark a keyboard in some way to say whether or not you have a good or bad keyboard from a score that is accrued through various tests. A keyboard very much boils down to whether or not you like it, can communicate with the easily and it’s comfortable for you to be productive or enjoy some leisure time. 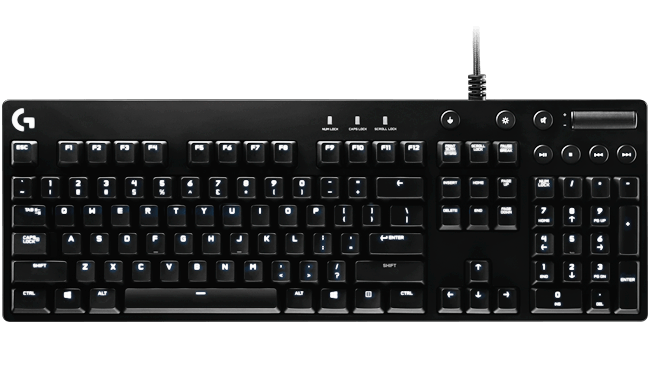 The Logitech G610 is an entirely different keyboard to the Logitech G510. Where the G510 focused on additional features such as media, LCD screens, gaming profiles and programmable buttons the G610 loses all of that in favour of an entirely new hardware approach and a back to basics gaming experience that is determined to win the user over through performance as opposed to extra features. The G610 features Cherry MX mechanical switches. These are favoured by gamers and considered to be a standard as they are more consistent in feel and responsiveness, they can take more abuse than rubber dome keyboards. These low-noise switches have a linear keypress for rapid-fire actuation. Cherry MX switches are rated to over 50 million keystrokes and actuate precisely for a reliable gaming experience. To be honest I find the G610 is a bit of a let down whenever it comes to included features. 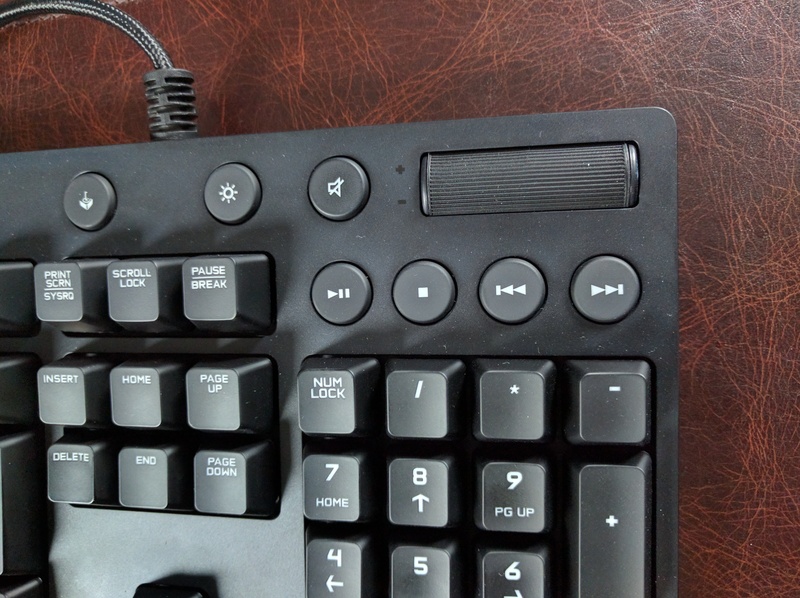 I love myself some extra buttons to be able to program for additional functionality on the computer and save for some Media buttons in the top right corner the G610 doesn’t provide any of that. Of course you can program the function buttons on the top row from F1 to F12, however having some dedicated memory buttons is a great feature that most gamers these days will probably have started to rely on even if it is just for storing Memes. There isn’t even a wrist rest included in the box. That said I would imagine including extra buttons and features would have ramped up the price of this keyboard drastically. Tearing out the membrane innards of the G510 and putting in a whole mechanical key array would ramp up the costs before you know it. How is the performance of a gaming keyboard when of all the media buttons have been removed? It’s hard going, it takes a while to get used to especially if you have been using something other than a mechanical keyboard before. The travel on each key when pressing is a greater distance and can result in a multitude of errors especially when typing for a long period. When gaming the benefits are noticeable almost immediately. The slightest touch of a button registers which results in near instantaneous reactions. Hardly ideal for typing a document however once mastered there is nothing quite like tapping away at a keyboard that emits a satisfying clack. The look and feel of the keyboard it’s very simple with almost a no frills approach, aside from the backlight. There’s a lot of fun to be had here as the lighting flickers in uniform depending on how you have the keys set to light up. There is a dedicated button for the backlight however rather than being an on/off button, you have to press the button number of times to dim the backlight and gradually turn the backlight off. A simple feature of holding the button in to turn the backlight off might be nice as if you leave your computer on 24 hours a day that means the backlight on your keyboard is more than likely going to be on with it. When the computer is locked the keyboard takes it upon itself to display some eye candy, lighting up keys and simulating a wave of light from left to right. The backlight is bright at the highest setting, every key is visible. The volume roller is large and responsive, it’s easy to find alongside the rest of the media controls that surround it. Hastily jamming your finger down in that area generally meets with the required function you’re looking for. 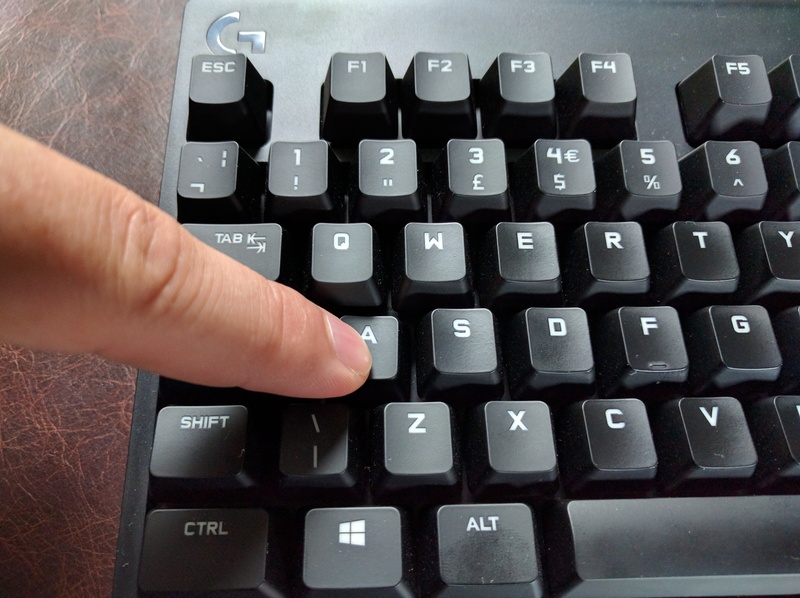 Various other keyboards on the market have a small congregation of keys that are interlinked, this one goes for large and separate and therefore less room for error. 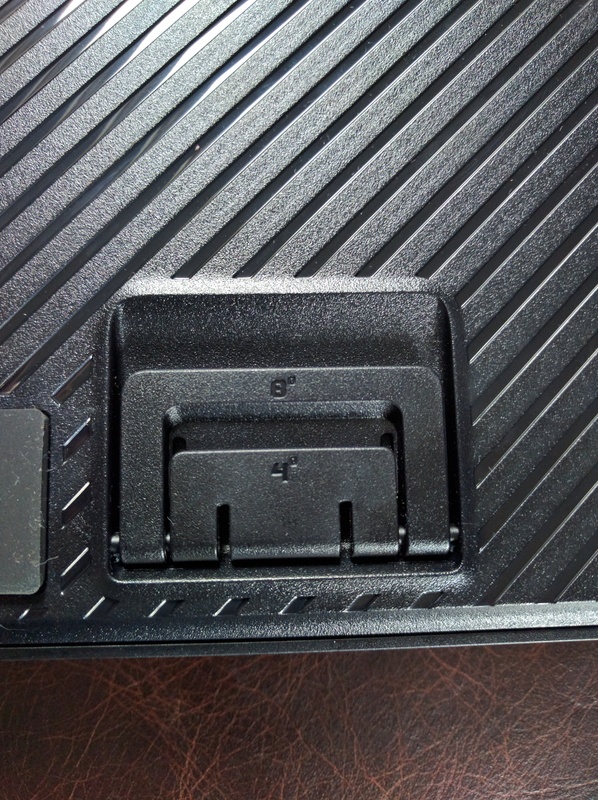 One of the best features are the legs of this keyboard, there are three options. Laid flat on the rubber feet, setting 4 and setting 8. I am guessing the 4 and 8 are millimetre elevation. 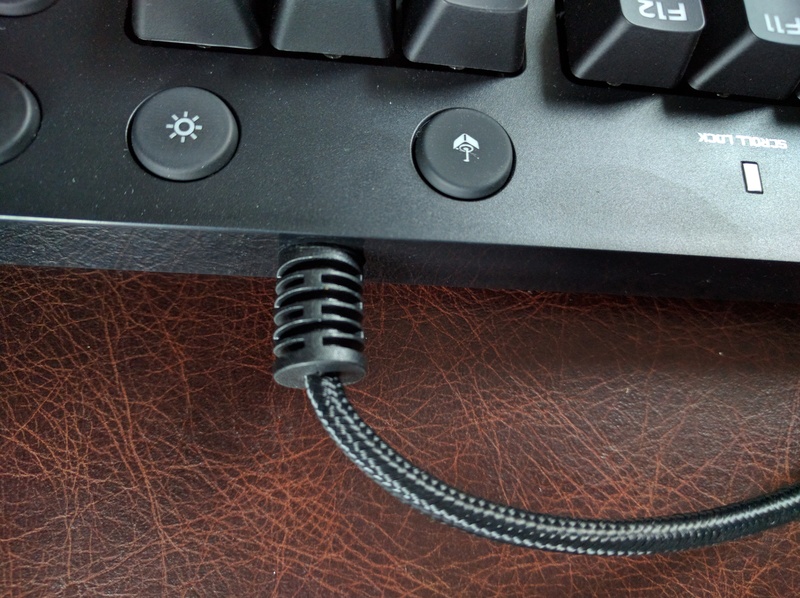 Also, cable and the connection between the cable and the keyboard is nicely reinforced. This keyboard will travel well and it built to last. Logitech has a very simple to use interface when it comes to the software for the keyboard. Everything is laid out very nicely and is very simple to navigate around. Icons are colourful and explanatory and there is a wealth of options available on how to set up the keyboard for various different profiles. It’s easy to switch between profiles to display various keys being highlighted when using a particular game, these profiles can be amended to the user’s preference or setup from scratch. Would I carry on using the Logitech G610? Unlikely, I don’t game as often as I used to and spend much more time writing. In all honesty, I’ll be moving back to the Logitech G510 once I finish writing this. The G610 will go to my stepdaughter who is an avid gamer playing World of Warcraft and League of Legends. The keyboard will easily benefit her and be a welcome upgrade to the aging and noisy Corsair she has been using.